Google SVP Sundar Pichai announced that his company will sell an unlocked version of the HTC One with the stock Nexus UI for $599, starting on June 26. 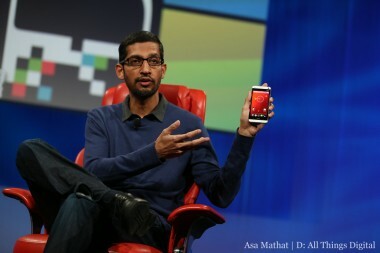 Pichai also said he’s not worried about Samsung’s dominance among Android manufacturing partners. When asked why Microsoft started making hardware, ex-Windows boss Steven Sinofsky said great user experiences come from an interconnected ecosystem. “That’s an engineering thing,” he said. While many have long suspected as much, Nuance CEO Paul Ricci officially confirmed that the company’s technology is a “fundamental provider” present in Apple’s voice-controlled personal assistant, Siri. Atheer, SmartThings and Fanhattan demoed three next-gen control interfaces: A wearable computer controlled by motion-sensing 3-D glasses; a home full of everyday devices controlled by a phone; and a TV set-top box controlled by a “little Zen rock” remote with 200 sensors but no buttons. San Francisco 49ers CEO Jed York and Sony CEO Kaz Hirai discussed the 49ers’ new home, Levi’s Stadium, which will offer a “tech-immersive experience” by, for example, letting fans watch instant replays on their tablets. The stadium will play nicely with whatever tablets customers bring in — not just Sony-made devices. These five blurbs only scratch the surface. For more, please check out our full list of stories from D: All Things Digital.